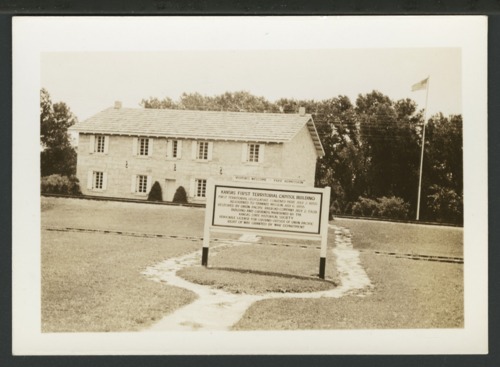 Here are two photographs of the First Territorial Capitol building at Fort Riley, Kansas. Clarence and Janice Fornwald took the photographs while they were on their honeymoon. They started from Pittsburg, California, and traveled through Utah, Kansas, Wyoming, Colorado, Pennsylvania, Washington, D.C., New York, New England, and eventually to Quebec, Canada. The First Territorial Capitol was added to the National Register of Historic Places in 1970.